Xiamen, is a beautiful port city located in the southeast of China in the Fujian Province. The city, described by CNN as the perfect mix of urban energy and laidback vibe, has a vibrant expatriate community and among other attractions has the worlds longest elevated cycling path. The city has world class international schools, affordable expatriate housing and beautiful beaches. Xiamen Airlines operates a fleet of more than 150 B737 aircraft with 50 B737 aircraft on order. Xiamen Airlines flies 200 routes to over 70 domestic and international destinations. 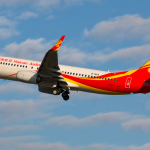 The airline was honoured with the title of “The Best Airline In Mainland China” for 19 consecutive quarters in the “Airlines Service Survey” made by CARNOC.com. Xiamen Airlines has an excellent safety record and is favoured as an employer by expatriate captains. Xiamen Airlines offers excellent remuneration, including education allowance and housing allowance. In addition to residential employment, Xiamen Airlines offer eight different commuting roster options; from 17 days on – 13 days off though to 2 months on – 2 months off. Xiamen Airlines will contact Flightdeck to advise the outcome of the screening process and to request your availability to attend the next stage of process. The final stage of the employment process is a CAAC Simulator Check, this takes approximately one week. Xiamen Airlines will provide flights and hotel for the final stage of the process.